Cape Town to Simon's Town. Day 6. We intended to stay at Hout Bay, after looking at various accommodation options, we decided to stop for lunch at the Chapman's Peak Restuarant, famed for its calamari which was very good. Then we moved onto Simon's Town where we found a lovely small hotel overlooking the marina and port. Saturday, 9 August, excellent lunch at the Black Marlin, Millers Point, during which three humpback whales surfaced and swam very slowly past, F & M were really excited. 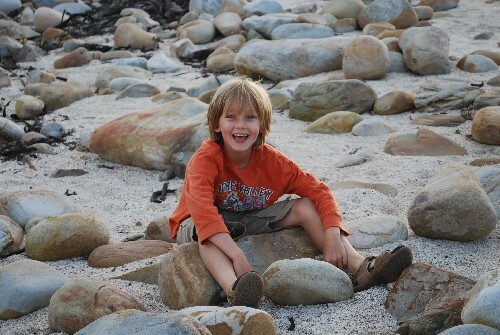 Our destination was the Cape of Good Hope, see pictures. We drove into the reserve and soon came across a family of baboons, the kids seem to relate quite well with them! We climbed to the highest vantage point, the view was breathtaking. Once again the whales surfaced giving a 1/2hr show. The Cape of Good Hope lived up to its name - wouldn't want to be around there in a boat! A wild and tempestuous ocean. Sunday 10th Spent the morning driving along the coast - stopped at the Brass Bell right on the ocean for a drink. Apparently they have to take the windows out on a regular basis to stop them being smashed up on high spring tides. Afternoon we drove to Kirstenbosch botanical gardens for a peaceful couple of hours admiring the bet of the cape's plants. Stunning. Monday 11th left the cape for the vineyards of Franschhoek, close to Stellenbosch. Much more civilised. Leisurely lunch with wine, of course. Tuesday a bit of culture at the museum, discovering the local history about the French Huegenots who came to (and effectively founded) Franschhoek in the late 18th century. Then a wine tasting at one of the many local vineyards followed by a bit of drama as an uncontrolled fire raged on neighbouring land and our host had to run off to check his vines weren't in danger (luckily they weren't). After a walk back into town we had lunch at yet another vineyard, La Grand Provence which was spectacular fine dining, but outside so FM could run around between courses. Weather today was around 25 degrees C.
Wednesday 13 August drive to Hermanus - whale watching. After finding accommodation we went for lunch to Bientang's Cave, right down by the water (still Atlantic). Wonderful show by a couple of Southern Right whales, jumping right out of the water (breaching) and slapping their tales around, Great stuff. Later found a tennis club for Max. Thursday 14. More tennis then a whale watching boat trip, 2hrs in a 3-4 meter swell, incredibly we survived intact. Great viewings of the whales although sadly none of them breached whilst we were nearby. Check the photots.